I want a dog, but my landlady is a cat person. I’ve whined, begged & offered a hefty security deposit trying to change her mind. Keeping a dog by your side has been considered a healthy habit for 10s of 1000s of years. Research shows that dogs can prompt us to be more active & less stressed, & dog owners tend to visit the doctor less often & live longer. After a string of robberies in our neighborhood & my own encounter with a naked man on a nearby running trail, I tried to convince my landlord that we would all be safer with a dog around. It’s still a no. Enter Pickles — a snorting, wheezing, wiggling 15 pounds of smoosh-face French bulldog bliss that is technology’s answer to my dog dilemma. Using a new app called Bark’N’Borrow, an Uber-type matchmaking service, we borrowed Pickles recently for an overnight dose of dog companionship. The idea behind Bark’N’Borrow & other new dog-service apps like Rover & Dog Vacay is to create a community of dog lovers both with & w/out dogs — pairing those who crave canine companionship w/dogs that could use a little more people time. Bark’N’Borrow also connects dog owners for pooch playdates & has a portal for potential dog-sitter matches as well. Rover & Dog Vacay, meanwhile, offer boarding options for pets in people’s homes rather than a kennel. Given that services like Airbnb, Liquid, Fon & Getaround allow people to share their homes, bikes, WiFi & cars, it was only a matter of time before pets got involved in the sharing economy too. To start, I set up an online profile on Bark’N’Borrow, sort of like an online dating service, w/photo, personal information, my reasons for wanting to meet a dog & the qualities I’m looking for in a dog. The basic service is free & payment is required only for dog-sitting services. After asking for a dog that was “easy-going, good w/people, good w/children, good w/other dogs, good w/other animals & good w/strangers,” 2 matches in my area popped up right away. I had the choice of a 4-year-old golden retriever named Ringo & a 5-month-old French bulldog named Pickles. They both looked great, so I took the next step — contacting the owners. Specific prompts allowed me to suggest a time & location for meeting in person. Dog owners have various reasons for using Bark’N’Borrow. Some work long hours & worry about keeping a dog cooped up at home all day. Some are frequent travelers who would rather have the personal touch of a borrower versus a kennel. & some, I would soon come to find out, just believe in sharing their precious pets w/people like me bc they’ve seen the good it can do for both sides. By now you’re probably wondering how anyone could leave a beloved pet with a total stranger. Bark’N’Borrow’s founder, Liam Berkeley, told me the company took great pains to verify users, linking to their Facebook profile or other public information, & that someone actually reviewed every account before giving anyone the green light to interact w/the rest of the community. A similar service in Britain & Ireland called BorrowMyDoggy has amassed 1000s of users & more than 200,000 Facebook fans in the 3 years it has been operating. 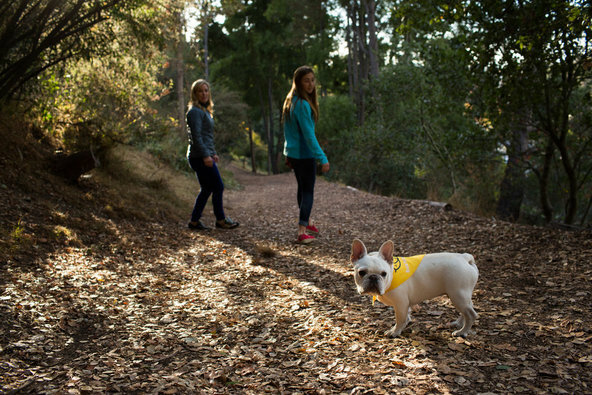 The San Francisco-based start-up Walkzee has also been met w/widespread approval for pairing people w/animal shelter dogs to take for walks. Walkzee has been in beta-testing for several months in more than 100 shelters across America & went live to the public this fall. Kirsten Harris, a 23-year-old who works at a tech start-up in Los Angeles, responded to my in-app query w/in a few minutes. After a few emails, we agreed to talk by phone. During our phone call, I learned more about Pickles — who is friendly, well-behaved, housebroken & at the tender age of 5 months, already a veteran to the Bark’N’Borrow process. I told her about my family & my reasons for wanting to borrow a dog. I explained about our home, nearby dog-walking trails & parks, my experience growing up w/dogs & my landlady, the cat lady. We agreed to meet. Ms. Harris & Pickles met my daughter & me outside our home less than 8 hours after we 1st connected on Bark’N’Borrow. A bowlegged blond beast basically leapt out of her arms & into our hearts. 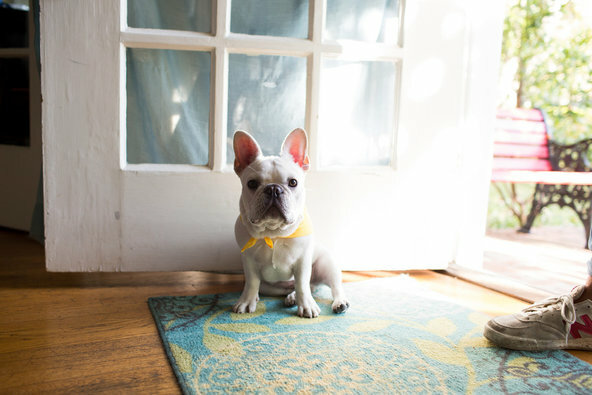 Ms. Harris told us that the motto of the French bulldog is “Love the 1 you’re with,” & Pickles definitely lived up to his breed’s reputation. His regular borrowers include a mother & 2-year-old son & a 30-year-old woman & recent Manhattan transplant who borrows Pickles overnight every few weeks for companionship. Ms. Harris, on her way to San Francisco for the night, stayed for a while & watched Pickles & my daughter play in the yard as Pickles shredded some leaves & discovered the small green apples that had fallen from our trees. Our night w/Pickles was everything we had hoped for & more. Pickles wrestled w/my daughter’s long hair & snuggled on my lap. After a few barks when my husband got home from work (a watch dog! ), Pickles ended up sleeping in our bed, right between our heads. The next day Pickles traveled w/my family to a cross-country meet, where he mingled w/other dogs, high schoolers & parents who wanted to know where they could borrow a dog too.